αγγλικές λέξεις από τα ελληνικά « English Words of (Unexpected) Greek Origin. 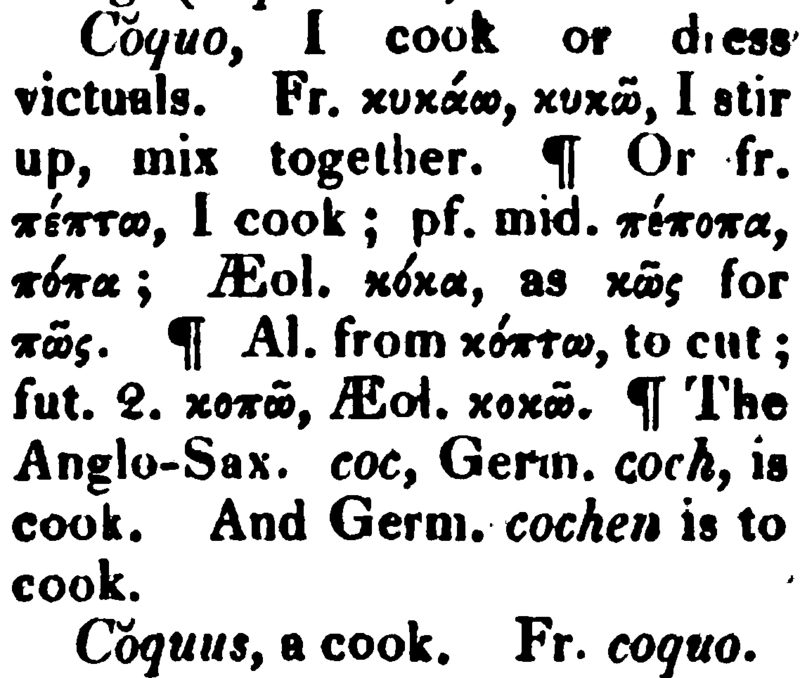 The word cook (n) comes from the Latin cocus (cook) from the verb coquo[to cook, to think, to be unquiet, to worry (about), to mix], which most probably derives from the Greek verb cycao/cucao [stir up, mix together; Gr:κυκάω]. Others etymologize coquo from the Greek verb pesso [to cook, to boil, to make something soft (Gr. : πέσσω); Att. : petto (πέττω); later pepto (πέπτω), peptic]. Finally, a few etymologize coquo from the Greek verb ceo (burn; Gr: καίω). Griffon is a type of dog. The word griffon (also griffin or gryphon) comes from the old French grifon from the Latin gryphus / grypus, a transliteration of the Greek gryphon / gryps [Gr: γρύφων; lit. curved, hook-nosed], a legendary mythological creature with the body of a lion and the head and wings of an eagle. The verb kiss comes from the old English cyssan, from the German kussen from the Greek kysso (Gr: κύσσω/κύσω; fut. of the verb kyneo, Gr: κυνέω: to kiss). The word dime (coin worth one tenth of a US dollar, a 10 cent coin) comes from the old French disme (a tenth part), from the Latin decima [tenth (part)], from decem (ten), from the Greek deca (ten). See also “etymology of dean” here . Agnes is the latinized form of the Greek name Agne (Αγνή), which derives from the Greek adj agnos (chaste, pure, clean; αγνός). Το όνομα Agnes προέρχεται από το εληνικό όνομα Αγνή.